When last we left them, Edward (Robert Pattinson) and Bella (Kristen Stewart) had their baby. Jacob (Taylor Lautner) had imprinted on her, meaning he would protect her. When the Volturi (the elders of the vampires, responsible for maintaining law and order, as well as the secret of the vampires) get wind of the baby, they make their way to deal with the issue. Centuries ago, a group of vampires had turned some children. The children were unable to keep the secret of the vampires. Subsequently, the children had to be destroyed by the Volturi. As punishment, the creators were destroyed, as well. Edward and his crew knew they would meet the same fate. The difference in their situation is that Renesmee (Mackenzie Foy) was not a child who was turn, who never aged. She was half vampire, half human. Therefore, she was not the same type of threat as turned children. But the Volturi would not listen to Edward and Bella and spare them all. Edward and his coven head out to get “witnesses” who can attest that the child was not a threat. But would the Volturi listen even to the collection of witnesses? Jacob, as Renesmee’s protector, amassed his own battalion of werewolves to help protect her, if it came to war. 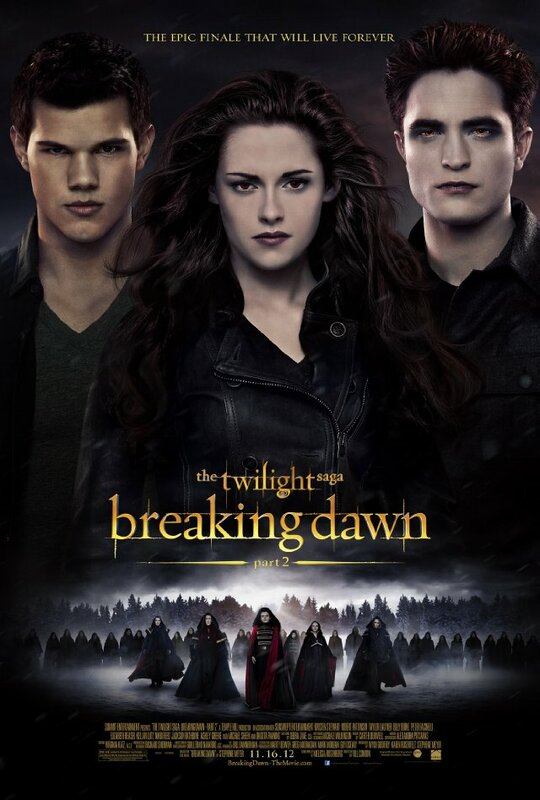 As Twilight movies go, I have to say this is the best of the saga. Keep in mind, though, that it is merely the best of the Twilight movies. Which isn’t saying much. I was compelled to watch Breaking Dawn Part 2 simply to finish the series. I had been coerced into seeing Eclipse by a friend. So as to not go in completely unaware, I did my homework and watched the beginning of the “epic.” I stand by my assertion that the entire series could have been more effectively done as 2 or 3 movies, tops. Spreading it out to 14 movies was too much. The pace of the series was much too slow. The same goes for the first hour or so of this latest installment. Robert Pattinson, Kristen Stewart, and Taylor Lautner suffer the same problems they do in the previous movies. Their poor acting ability. Kristen being the worst. Perhaps even worse than any of them was her spawn. I understand they needed the baby to perform certain tasks at specific times, but using a CGI baby for the newborn was too much. It looked more than a little creepy. I found Dakota Fanning completely ineffectual and almost ridiculous in her role. I don’t know if she was just the victim of poor writing. You’ll see what I mean if you sit through this train wreck. Things turn around when the battle starts. I was actually mildly entertained. As entertained as one can be watching a Twilight movie. There were several points where I found myself invested in the outcome. There were also several times where I was laughing at the action in the battle. This is one of the few movie series that I was elated that it had ended. Again, I felt I had a duty to see it to its conclusion. And I’m glad I did. I made it through to the best part of the series. It gave me a sense of accomplishment. And nothing could make me happier than knowing I won’t have to sit through one more minute of this twinkling vampire nonsense.